It has been interesting to watch each rescued monkey learn what it’s like to be a monkey outside the cement and stainless steel laboratory cages where they lived for so long. Here in south Texas, they are free to discover sunshine, rain, dirt, grass, climbing, running and water. 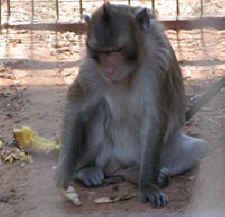 You might remember that back in July 2010 we rescued a group of long-tail macaques from a life spent in an East Coast laboratory. I am happy to report that today, they are doing well. Shortly after their arrival, with the help of a vet, we neutered all of them. Currently they are housed in several of our semi-natural enclosures in small groups of four or five. After some minor quarrels within each group to establish the hierarchy, everyone has settled in. It has been interesting to watch each one learn what it’s like to be a monkey outside of cement and stainless steel. Here in south Texas, they are free to discover sunshine, rain, dirt, grass, climbing, running and water. Oh yes, large troughs of water. One “LT” will patiently wait for us to clean and fill his trough with fresh, cool water, and then he will jump in, submerge himself and swim around. As time has gone by, we have been able to watch their individual personalities come out. Gizmo will sleep sucking his first finger, and then he will get upset if you catch him doing it. Sammy will lip smack at you while trying to put his leg over his head. Not only have they made friends within their small groups, they have been making friends with the neighbors. Gizmo’s group is next to a family of bonnet macaques. We have seen them grooming each other through the fence. Sammy’s troops are in an enclosure outside of the large enclosure that they will be going into, and are bonding with the current residents. We are hopeful that their transformation from a life in a lab to that of wild monkeys will continue to be a successful one.